From Tatjana Soli, The New York Times bestselling author of The Lotus Eaters, comes a breathtaking novel of a California ranching family, its complicated matriarch, and the enigmatic caretaker who may destroy them. When Claire Nagy marries Forster Baumsarg, the only son of prominent California citrus ranchers, she knows she’s consenting to a life of hard work, long days, and worry-fraught nights. But her love for Forster is so strong, she turns away from her literary education and embraces the life of the ranch, succumbing to its intoxicating rhythms and bounty until her love of the land becomes a part of her. Not even the tragic, senseless death of her son Joshua at kidnappers’ hands, her alienation from her two daughters, or the dissolution of her once-devoted marriage can pull her from the ranch she’s devoted her life to preserving. But despite having survived the most terrible of tragedies, Claire is about to face her greatest struggle: an illness that threatens not only to rip her from her land but take her very life. And she's chosen a caregiver, the inscrutable, Caribbean-born Minna, who may just be the darkest force of all. Oh Claire, you're such a stubborn woman. Your family falls apart but you're more concerned with the land, the trees, the way the soil tastes. When you become seriously ill your daughters really have no interest in caring for you. Why is that? Because you let them go so easily in the first place? Perhaps. Along comes Minna, a girl you hire to care for you after talking to her for about 5 minutes. Where did she come from? What is her story? You won't ask yourself those questions until it's much too late. The Lotus Eaters was a great book. 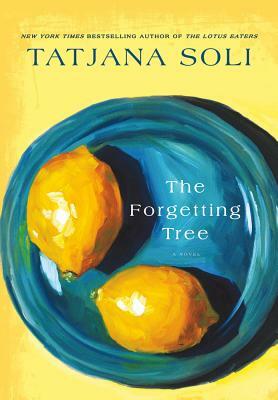 The Forgetting Tree is even better. Sounds interesting! I have seen this book a million times and now I will go pick it up next time I see it at the library! It's a crazy good trip, I hope you like it! That's quite a set up! Liking the sound of it though, for all the aloofness and darkness. It definitely had me on the edge of my seat. Just when you think you know what's coming...BOOM! No you don't! That cover is beautiful, I love yellow (and so do you, judging from the look of your blog? ;))! It somehow doesn't match the darkness going on in the book itself. Sounds like a really good thriller! Yellow is my all time favorite color ;) You're right that the cover doesn't match the insides! Looking at the cover you'd expect a cheery story wouldn't you? Nope!